141 Qianmen Xidajie, Xuanwumen, Beijing 100031, P.R.China. The Cathedral of the Immaculate Conception (Chinese: 圣母无染原罪堂), colloquially known as the Xuanwumen church (Chinese: 宣武门天主堂; pinyin: Xuānwǔmén Tiānzhǔtáng) or Nantang (Chinese: 南堂; literally: 'the South Church') to the locals, is a historic Roman Catholic Church located in the Beijing, China, Xicheng District, near the Beijing Financial Street. While the original foundation of the cathedral was in 1605, making it the oldest Catholic church in Beijing, the current building in Baroque style dates from 1904. The present Archbishop Joseph Li Shan, installed in September 2007, is one of the few Catholic bishops also recognized by the Chinese Patriotic Catholic Church. The church has been closed for repairs since 10 December 2018. The Cathedral of the Immaculate Conception, as a foundation, dates back to 1605, in the 33rd year of the reign of the Wanli Emperor of the Ming dynasty. When the Italian Jesuit Matteo Ricci arrived in Beijing, the Wanli Emperor permitted him a residence slightly to the west of the site of the current cathedral, near Xuanwumen. Attached to this residence was a small chapel, in Chinese style, with only the presence of a cross atop the entrance to distinguish it as a church. This was at the time referred to as the Xuanwumen Chapel (宣武门礼拜堂). The Shunzhi Emperor was friendly to Schall and the church, visiting it no less than 24 times, bestowing upon it a stone stela with the words 'built by Imperial Order' (敕建) inscribed upon it. In 1690, Beijing received its first Roman Catholic bishop in three hundred years, the Franciscan Bernardin della Chiesa, and the church became a cathedral. The cathedral was damaged by fire in 1775, the 40th year of the reign of the Qianlong Emperor, who donated 10,000 taels of silver for restoration work, and also bestowed a calligraphed board in his own hand, inscribed with the characters '万有真原' on it, meaning 'The True Origin of All Things'. 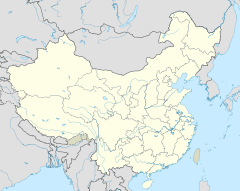 In 1838, in the 14th year of the reign of the Daoguang Emperor, due to constant conflicts with the power and influence of the Catholic Church, for the sake of peace, the Qing government decreed a restriction of the activity of the Catholic Church in China. In this decree, the cathedral was confiscated by the government and remained such until the end of the Second Opium War, when the Catholic Church was again permitted to act freely. The cathedral was reopened in 1860 under the leadership of Bishop Joseph Martial Mouly. When the Boxer Rebellion broke out in 1900, all the churches of Beijing were targets of vandalism, and on 14 June 1900, the cathedral was set razed to the ground, together with most other churches of Beijing. The cathedral is possibly the best known to foreigners in China, as English-language masses are celebrated there. The cathedral is currently (April 2019) closed for renovation and the English Mass is being held at 1400 in the North Church. The Italian/Spanish mass is at 1000 in an outbuilding of the South Cathedral. Masses are held in multiple languages. Weekday masses are held Monday to Saturday in Latin at 06:00, and then in Mandarin at 06:30 and 07:15. On Saturday, there is a vigil mass at 18:30 in Mandarin that is a "youth mass". On Sundays, there are mass in Latin at 06:00, and Mandarin at 07:00, 08:30, 16:00, and 18:00. There are masses in English with readings also in French at 10:30, and in Italian with Spanish readings at 12:30. ^ Clark, Anthony E. "China's Thriving Catholics: A Report From Beijing's South Cathedral." Ignatius Insight August 20, 2008. ^ "Catholic Mass Times in Beijing", Our Lady of China English Foreign Community in Beijing, website visited on 21 February 2017. Wikimedia Commons has media related to Cathedral of the Immaculate Conception in Beijing. Clark, Anthony E. "China's Thriving Catholics: A Report From Beijing's South Cathedral." Ignatius Insight August 20, 2008. This page was last edited on 31 March 2019, at 03:14 (UTC).